Budget-friendly ways to transform old furniture into dazzling updated focal points. We challenge you to find a Southern girl who would turn down her grandmother's hand-me-downs. Inherited items are the lifeblood of Southern homes. Use our ideas to turn "before" items like this into "after" pieces everyone will adore! Before: This wing chair is covered in dated fabric, but has a uniquely striking shape. This chair goes from floral to sophisticated with a smart upholstery update. Exposing the wooden legs and adding a nailhead trim make this chair conservative yet hip. The perfect combo for a new couple's first home. The small print on this arm chair keeps it in the past. The frame is attractive and the exposed wood shows a lot of potential. Two of these $5 flea market sewing tables are just the right size for sofa side tables. We changed the look of this table by taking it to a wallpaper hanger who gave it a custom look by covering it with grass cloth. Using wallpaper to cover wooden furniture is a polished alternative to simply updating with paint. This blah sideboard is a nice functional piece, but was in desperate need of a trendy update. Another one of grandmother's hand-me-downs, this barrel chair has been put to good use over the years. Because it is sturdy and has retained it's shape it's a perfect piece to try a little recovering magic. Hard working pieces like this are a must for entertaining. This console just needs a few changes to take it from bland to glam. The console transforms into a swanky bar, thanks to a new coat of paint and a custom-cut limestone top. Any local kitchen or bath showroom can get a stone top cut to size. Scan the remnants section for odd-size leftovers that are bargains. This wood storage cabinet has stylish doors and is the perfect size for storing things in a small bedroom. The finish is a little dark so the piece could use a little updating. We brightened this piece up by painting it turquoise. At 12 inches deep, it’s small enough to fit the room but still big enough to hold five shoe storage cubes and lots of boots and handbags. Don't give up on an old piece! This old dresser seems to have lost it's luster. The finish is dingy and the style seems outdated. The old dresser got a fresh coat of white paint to help it blend in. An old map of Europe, found at a thrift store was the missing link. The weathered look adds a sense of history to the room. All this old (and may we say, drab?) chair needs is new fabric. Total gutting is not required. For this chair we kissed the why-was-it-ever- popular avocado green velvet good-bye and refreshed it with a prettier sage fabric. A darker stain on the legs and sides lends an elegant touch. The heavy skirt and loose cushions on this chair make it obvious that it's from the 1980s. Ask your upholsterer to expose chair legs (stain or paint them first) by eliminating the skirt, and then opt for a tight-back cushion. We added a small lumbar pillow here for extra back support. This cringe-worthy wood-framed sofa was found by a dumpster. Now, a personality-filled piece, freshened up with a bold pattern and white paint. Designer: Jamie Meares, Furbish Studio, Raleigh, NC; furbishstudio.com. Sofa fabric: custom by Furbish; furbishstudio.com. 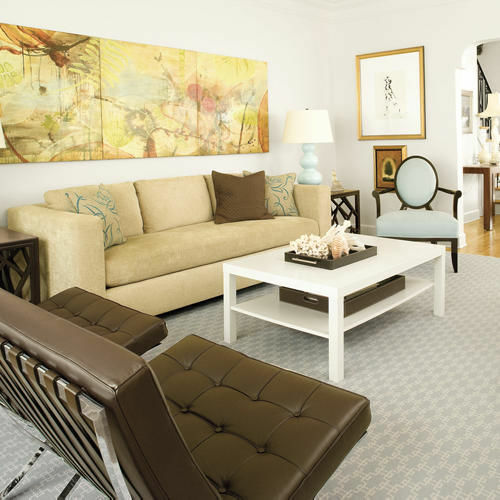 Sofa paint: ProClassic Alkyd Interior Enamel in White; sherwin-williams.com. Wallpaper: Foxglove (W5805-03) from Hothouse by Suzy Hoodless for Osborne & Little (osborneandlittle.com). A classic shape fallen victim to a dated floral. Updated with a subtle ticking stripe with a vibrant, one-of-a-kind ikat center. Chair paint: ProClassic Alkyd Interior Enamel in White; sherwin-williams.com. Chair fabric (ticking): for assorted ticking fabrics, try Robert Allen (robertallendesign.com). Chair fabric (ikat): Mercury P6324 in 23002 (1101357) from Lewis & Sheron Textiles (lsfabrics.com). Wallpaper: Angles Wallpaper in Silver/White by Hygge Cooperative (hyggecooperative.com). Pretty but expected Swedish dining chairs. Stylish seats updated with tailored gray leather and nail-head trim. Designer: Tara Shaw, Tara Shaw, New Orleans; tarashaw.com. Chair leather: For a similar look, try Milano in Platinum (9250/15) by Holly Hunt Leather (hollyhunt.com); 212/755-6555. A tired, sagging settee with an interesting shape and mid-century legs. An attention-getting perch with a shape that's exaggerated with unexpected horizontal stripes. Designer: Cynthia Collins, Collins Interiors, Dallas; collins-interiors.com. Fabric (stripe): Pacifica in Fuchsia by Steven Harsey Textiles (harsey.com); 954/925-1133. A plain Asian chest with an imposing black finish and lack of hardware. An impressive sidekick with modern white lacquer and striking brass hardware. Cabinet paint: Linen White (912); benjaminmoore.com. The elegant curved lines of this bar cart were clouded in dismal shade of brown. The makeover: Painting the wheel covers gold and the frame a coral orange (Flame; benjaminmoore.com), along with new mirrors cut to fit atop the shelves, elevates this rattan cart from a computer trolley to a host's best friend. Monochrome upholstery and paint in a tired palette had this caned chair in need of an upgrade. The makeover: Dingy paint and fabric kept these caned chairs from a bright future. Fiery red lacquer (Candy Cane Red; benjaminmoore.com) and new chinoiserie upholstery (Coromandel; fschumacher.com) put them back in the seating game. A china cabinet with good bones lacked pizzazz under a sea of beige paint. The makeover: A pale gray lacquer (Dovetail; sherwin-williams.com), paired with crisp white trim and a graphic papered interior (Zebras; scalamandre.com), wakes up a faded but handsomely proportioned cabinet. This stately dresser was begging to make a statement, but an unfortunate hue was forcing it to fade into the background. The makeover: Metallic gold trim highlights this piece's ladylike curves and elegant detailing, while a coating of masculine navy lacquer (Marine Blue; benjaminmoore.com) keeps the look from veering too matronly.